The SAT exam has become a standard fixture for students in their final years of high school. Sitting the exam is as much a right of passage, as it is an entrance level requirement for those students planning to continue their education at the university level. But the SAT has gone through some changes in the last few years, with new tests having been added and a revised method of scoring. Students preparing to take the SAT can benefit from a short overview of the test, it's recent changes, and it's value to the college-bound student. So what’s so new about the SAT? The format of the SAT remains much the same. Several tests are taken, each lasting approximately 25 minutes with short breaks between sections for snacks and to let students stretch their legs. Previously the SAT was broken down into two main areas, mathematics and verbal skills. The recent revisions to the SAT have restructured the test into three graded sections – mathematics, reading and writing. Where once a student's score was calculated out of a possible 1600, the revised SAT allows for a top score of 2400. The new scoring procedure breaks down into 800 possible points for each section of the overall test. Scheduling and registering for the SAT remains the same. Students must sign up for the test, pay a registration fee and report to their assigned testing location on the scheduled exam day. Time: Two 25-minutes sections; one 20-minute section. Time: Two 25-minute sections; one 10-minute section. Time: Two 25-minute sections; one 20-minute section. The writing section is a new addition to the SAT, and students will now be required to write an essay on an assigned topic. The student will have no previous knowledge of the topics to be assigned, and must complete and outline and present a finished standard format essay in the time allowed. The new writing sections allows the exam review board to get a better sense of the language skills of the students taking the SAT exams. The essay portion of the test also allows college admissions boards to better evaluate the strengths of their applicants. What does the SAT Test Asses? The SAT, formerly the Scholastic Aptitude Test, now the SAT Reasoning Test, examines a students abilities to think logically, and to apply their reasoning skills to a series of standardized questions. The mathematical section examines the students understanding of general mathematical equations while testing their, arithmetic skills. The critical reading section determines a student's ability to read and comprehend verbal passages, and to think logically about language and language construction. The writing or section, or essay portion, tests a student's ability to construct and present a balanced argument or assertion concerning a given topic. The SAT test does not examine a students inherent knowledge, or memory skills. Specific information learned in school , and accumulated factual knowledge is not a part of the SAT testing procedure. While this has caused some controversy among educators, with many believing that test should examine a students general factual knowledge as well as reasoning skills, the SAT remains the accepted standardized test for graduating high school seniors and is still a requirement for all college applications. 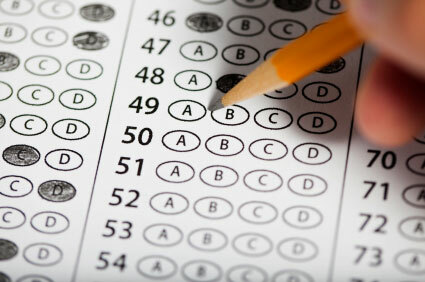 The SAT remains a requirement for all college applicants. That being said, every university gives different weight to SAT scores, and most admissions boards consider a variety of factors when determining a students eligibility for acceptance to university. If you do well on your SAT test it greatly improves your chance of being accepted to the college of your choice. However, more and more college admissions boards understand the the SAT is not always an accurate measure of a student's ability to do well in college. Even if your SAT scores are not perfect, your academic history, GPA and admissions essay will still hold a lot of sway with the college admissions board. In short, do the best you can when taking the SAT, but do not assume that a poor score excludes you from achieving your college goals. There is no real way to 'study' for the SAT. The exam is designed to test your reasoning skills and logic processes, and there is no specific information for a student to learn and repeat. However, taking the PSAT can help prepare you for the actual test by giving you a familiarity with the testing process, and the College Board website offers online sample questions to help you get comfortable with the testing procedure. Utilizing these resources will help you approach your SAT tests in a relaxed and confident manner, ensuring you perform your best on exam day.